Read the excellent Kraken by China Mieville. Quite fascinating book that crossed a lot of genre boundaries. 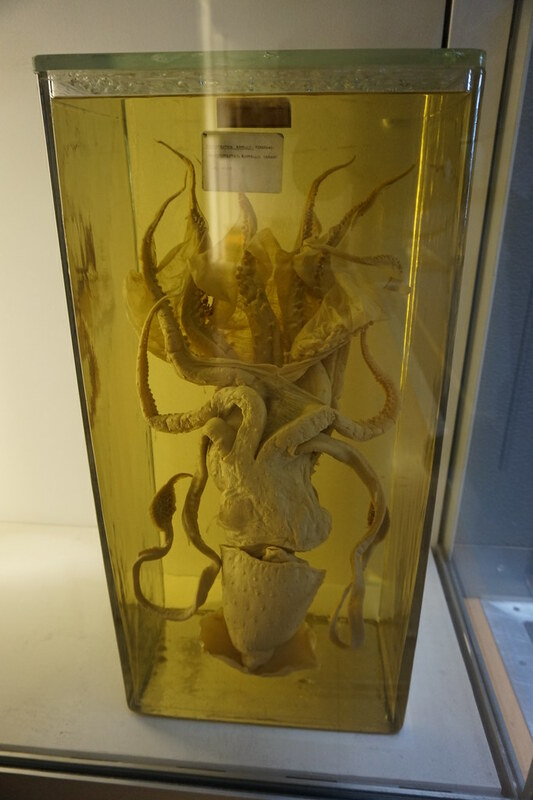 Since I was heading to London for meetings at the Natural History Museum, it seemed like a perfect fit ... sadly, I didn't get to go and see the giant squid (perhaps it was stolen?) but some some it's smaller cousins. From Kraken by China Mieville. The boy peeped. He looked at the bone apatosaurus that Billy had seemed to greet. Or maybe, Billy thought, he was looking at the glyptodon beyond it. All the children had a favourite inhabitant of the Natural History Museum’s first hall, and the glyptodon, that half-globe armadillo giant, had been Billy’s. The big room was walled with more shelves. There were hundreds more bottles, from those chest-high down to those the size of a glass of water. All of them contained lugubrious animal faces. It was a Linnaean décor; species clined into each other. There were steel bins, pulleys that hung like vines. No one would notice. Everyone would be staring at the great tank in the centre of the room. This was what they came for, that pinkly enormous thing. For all its immobility; the wounds of its slow-motion decay, the scabbing that clouded its solution; despite its eyes being shrivelled and lost; its sick colour; despite the twist in its skein of limbs, as if it were being wrung out. For all that, it was what they were there for. It would hang, an absurdly massive tentacled sepia event. Architeuthis dux. The giant squid. He left the Darwin Centre for the main museum. He saw no police there. He walked the route he used to take as a boy, past the staring ichthyosaur, stone ammonites, past where was now the café. There at last, in the middle of everything and everyone, he thought perhaps he heard a sound. The noise of a jar rolling. Very faint. But they’ve got some questions about you, for obvious, and curiosity can be a bit of a millstone. What was the point of dedicating your life to giving warnings if everyone who might have listened—because the majority were still unbothered and would possibly remain so till the sun went out—merely nodded and agreed? Dane drove past a small gallery and a dry cleaners, a market collection of junk, tchotchkes in multiplicity, urban twee. IN FRONT OF THE BRITISH LIBRARY, IN THE GREAT FORECOURT, A little crowd was gathered. Students and other researchers, laptops clutched, in trendy severe spectacles and woolly scarves. They were gaping and laughing. Each museum of London constituted out of its material its own angel, a numen of its recall, mnemophylax. They were not beings, precisely, not from where most Londoners stood, but derived functions that thought themselves beings. In a city where the power of any item derived from its metaphoric potency, all the attention poured into their contents made museums rich pickings for knacking thieves. But the processes that gave them that potential also threw up sentinels. With each attempted robbery came the rumours of what had thwarted it. Battered, surviving invaders told stories. 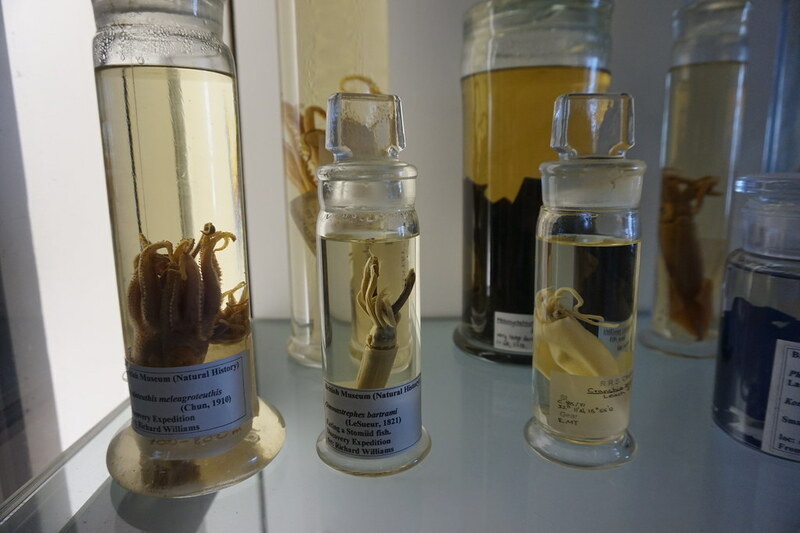 And in the Natural History Museum, the stored-up pickled lineage of the evolved was watched by something described as of, but not reducible to, glass and liquid. THERE ARE MANY MILLIONS OF LONDONERS, AND THE VERY GREAT majority know nothing of the other mapland, the city of knacks and heresies. Those people’s millions of everydays are no more everyday than those of the magicians. “Yeah,” she said. “I think we got that.” She smoked with the offhand elegance that reminded him of the girls he had been unable to get with at school. It was a skull on the top of a giant jar. A huge glass preserving bottle, of the type that Billy had for years been filling with preservative and animal dead. This one was nearly five feet high, full of flesh slough and clouding alcohol. On its glass lid was a shabby human skull liberated, Billy absolutely knew, from one of the cupboards of remains in the Natural History Museum. The custodians of the museums could hardly be comprehended: their agenda was memory’s, which is not human. There are only so many ways to experience pain. There are an almost limitless number of ways to inflict it, but the pain itself, initially vividly distinct in all its specificities, becomes, inevitably, just pain. What would evolution be if humans had not noticed it? Nothing. Not even a detail. In seeing it, Darwin had made it be, and always have been. These Beagle things were bloated. DARWIN’S SPECIMENS WERE SAFE. BILLY TOUCHED THEM, ONE BY one, stretching out his tethered hands behind him. He ran his fingers along the steel surface where no Architeuthis had ever been. 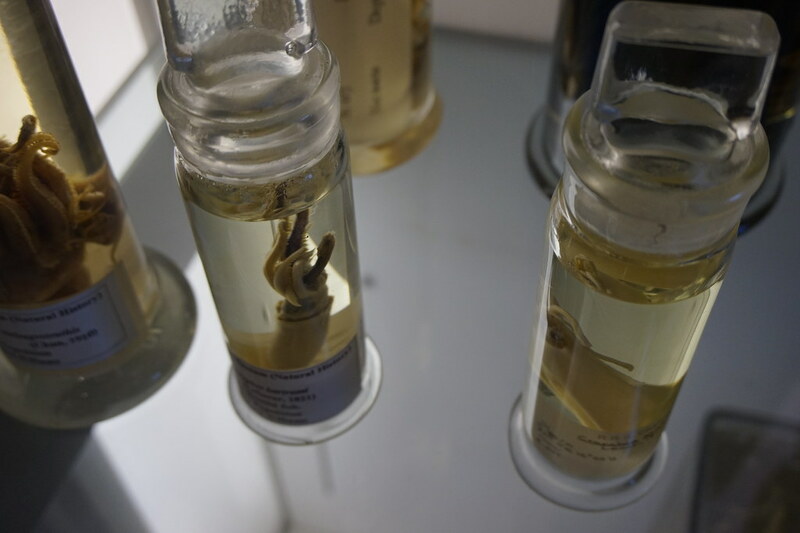 The tiny mnemophylax watched from under its bell jar. Its bone head tracked his movements.